I could not contain my excitement when I heard that Michael J. Malone had written a new book; his previous book, A Suitable Lie, was one of my Top 20 Books of 2016 and I'm still recommending it to people, almost 12 months on. 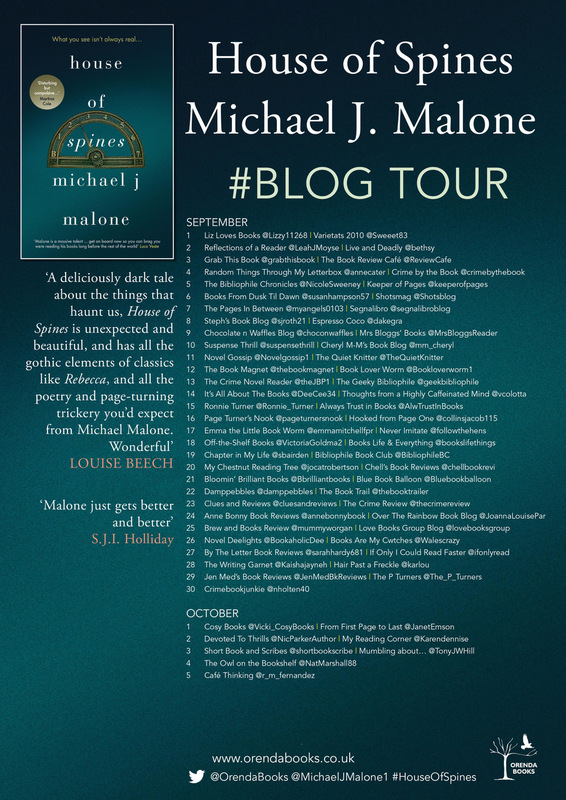 Michael J. Malone is clearly a natural storyteller and incredibly versatile author as House of Spines is so different from A Suitable Lie. Where one is raw and emotional, another is dark and gothic but both are linked by the psychological thriller genre as Michael J. Malone certainly knows how to get inside a reader's head and under their skin. House of Spines is as goosebump-inducing as it sounds and, although the spines in the title refer to books rather than skeletons, there are one or two skeletons preparing to leap out of Ran's closet (ghost-train style). Ranald McGhie thinks he's alone in the world after the death of his parents but, unbeknown to him, his mother had a living family of which she never spoke. Ran finds out that he had a Great-Uncle when he is bequeathed a house in his will, but it's not just any old house: Newton Hall - a mansion with a gorgeous swimming pool, a library that turned me green with envy and a haunted lift. Yes, a haunted lift...or so it would seem. Ran has a history of mental health problems and he meddles with his medication so you're never quite sure how much is real and how much is in his head. I love books where you want to know as much about the past as the present, although this isn't a traditional dual-storyline type of book, rather a past that refuses to let go of the present. I wanted to know as much about Great-Uncle Alexander and his love for Jennie, the servant girl, as I did about Ran in the present day. Ran's interactions with his newly found cousins, Marcus and Rebecca, had me seething with anger: Marcus is so dastardly and Rebecca so bitchy that they would go to any lengths to get Ran to sell the house to developers so they would get a share of the proceeds, but just how far will they go? Alexander's love for books is a common theme throughout and the vivid description of his library made me feel as if I had jumped inside the book and seen it for myself. Alexander's other great love was Jennie and their story continues to haunt me long after I finished House of Spines; leaving me considering whether it was unrequited love or true love. There are always two sides to every story and I really didn't know which one was true. Apparently, true love never dies but perhaps it haunts you forever! 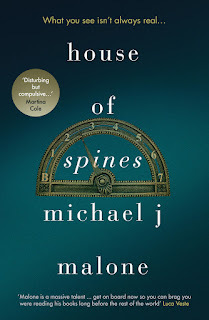 Cleverly written to be either a ghost story or one man's struggle with mental health, House of Spines is another exceptional book from Michael J. Malone. I read most of it with goosebumps on my arms and the hairs standing up on the back of my neck, as I loved the ghostly gothic feel. 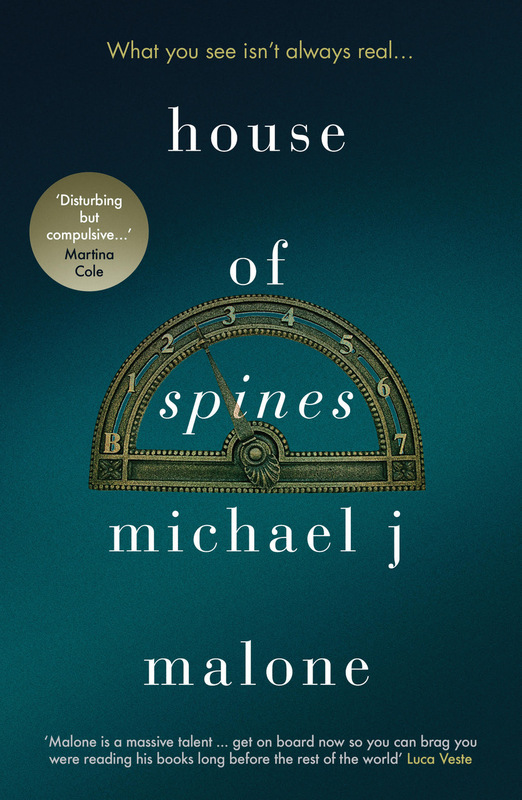 House of Spines is a spine-tingling multi-genre novel that absolutely anyone and everyone will enjoy; it's a psychological thriller mixed with a gothic horror and I loved every single page of it.